If you are just starting out as a fashion designer, you will want to choose the best equipment to enable you to do your best work. A good table for pattern drafting, drawing or rendering your final designs is a must. The tables for drawing you choose will depend on your budget, your space and the features that you want in a piece of equipment. If space is limited, a large drawing table may not be practical. In this case, a portable table may be an option. These tables usually have folding legs that allow them to be placed in a closet or under a bed when not in use. One disadvantage is that they tend to be less steady. A stationary table has more advantages but will probably cost more than a portable table. Features like a tilting top and drawers are usually not available in portable models. There will also be a wider range of styles and materials in a stationary drawing table. As a new designer, you will often find yourself doing many if not all the steps in production. A drafting table can come in handy when you have to draft a pattern from a sketch. A larger size table can give you flexibility in the sizes you can draft. An important consideration in choosing a table for drawing is the height of the table. 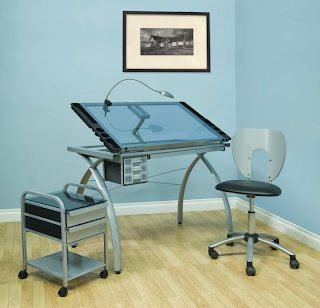 Desk height is generally 30 inches whereas drafting table height is usually 36 inches from the floor. With a drafting table, you have the option of sitting or standing to do your work. If you want your drawing table to fit in with a particular décor, there are many materials to choose from. Although most drawing tables are made of wood, other materials like heavy-duty plastics, metal, Plexiglas, and glass are available. For a designer, a glass or Plexiglas table can serve two functions. Place a light underneath the table and your desk now becomes a light box for tracing patterns.